1)Correa, A. M., Zlotowski, P., de, Barcellos, D. E., da, Cruz, C. E. and Driemeier, D. 2007. Brain lesions in pigs affected with postweaning multisystemic wasting syndrome. J Vet Diagn Invest. 19(1): 109-112.2)Seeliger, F. A., Brugmann, M. L., Kruger, L., Greiser-Wilke, I., Verspohl, J., Segales, J. and Baumgartner, W. 2007. Porcine circovirus type 2-associated cerebellar vasculitis in postweaning multisystemic wasting syndrome (PMWS)-affected pigs. Vet Pathol. 44(5): 621-634. 3)Drolet, R., Cardinal, F., Houde, A. and Gagnon, C. A. 2011. 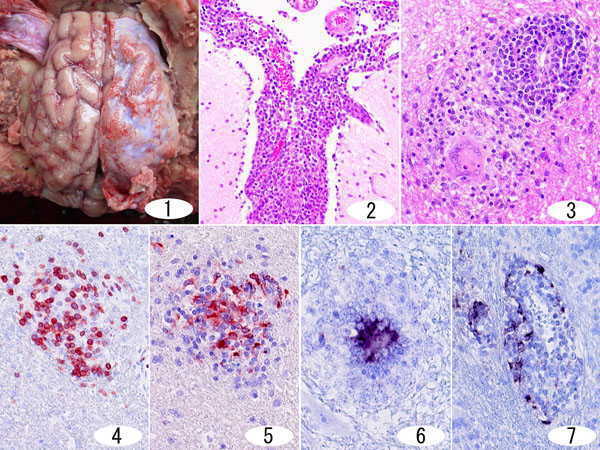 Unusual central nervous system　lesions in slaughter-weight pigs with porcine circovirus type 2 systemic infection. Can Vet J. 52(4): 394-397.